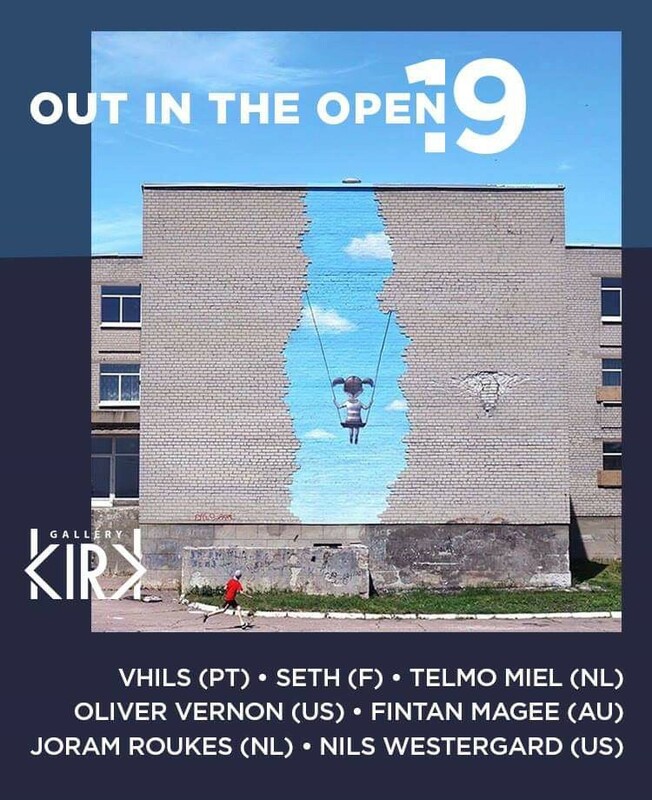 With the project "Out in the Open" launched in 2014, KIRK Gallery initiated several large scale murals by highly esteemed international street artists. The gallery´s intention with the project, is to get the art "Out in the Open", where as many as possible can experience beautiful street art. It was a pleasure to have the Irish muralist Conor HArrington here who brought to life this beautiful monochrome artwork depicting one of his signature colonial characters. The area chosen for the artist turned out to be the perfect site for one of his large scale murals. As he mentioned – the buildings at the street made the perfect surrounding for his work being an area of classical architecture. With this as a background the ancient history of the work gets emphasized even further and underlines the context even more. 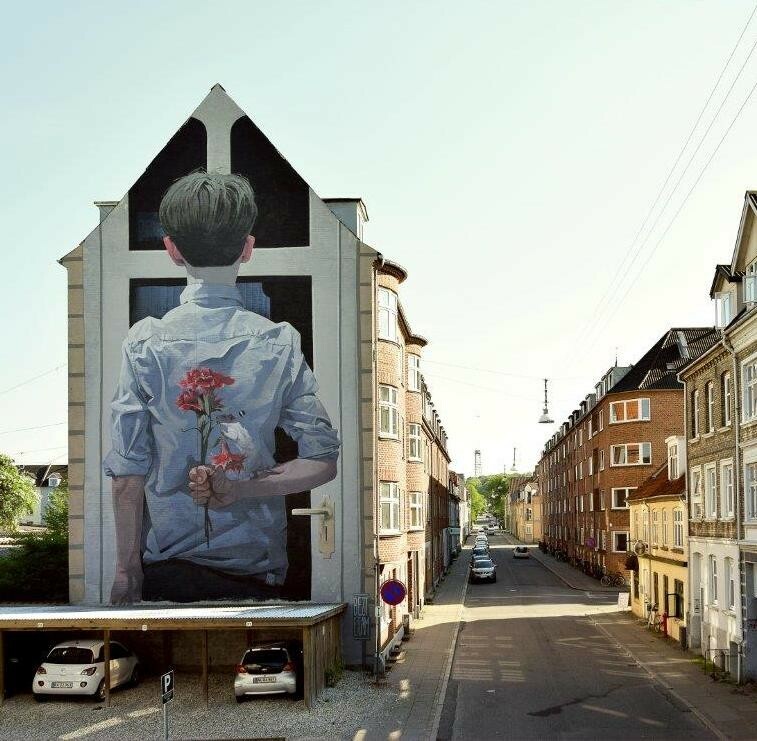 The mural is placed at Helgolandsgade 18. 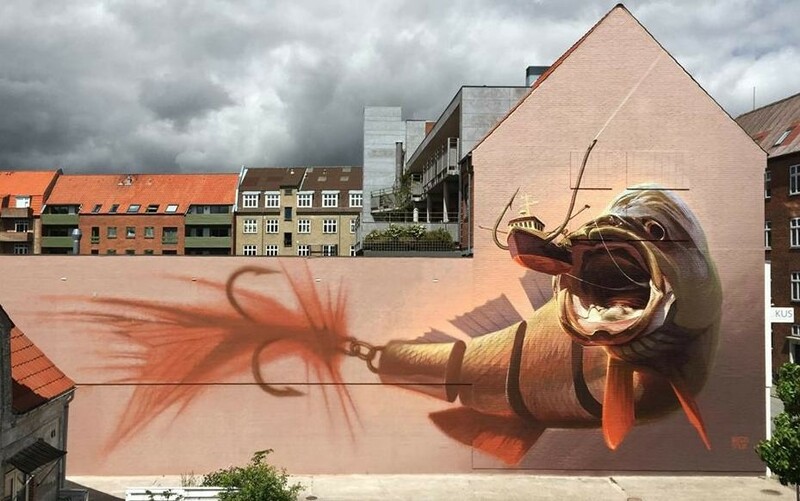 The mural in "Street Art News"
Also the two swiss street artists Wes21 (f.1989) & Onur (f.1981) has just finished a large scale mural at Dannebrogsgade 43; " Big Catch”. With the selected theme the artists want to touch the subject; "Who’s actually catching who and is getting the benefit of who? On the way to Berlin and after just having finished a big piece in the U.S.A., the two artist works intensely for a week in the pouring rain to get the work finished. 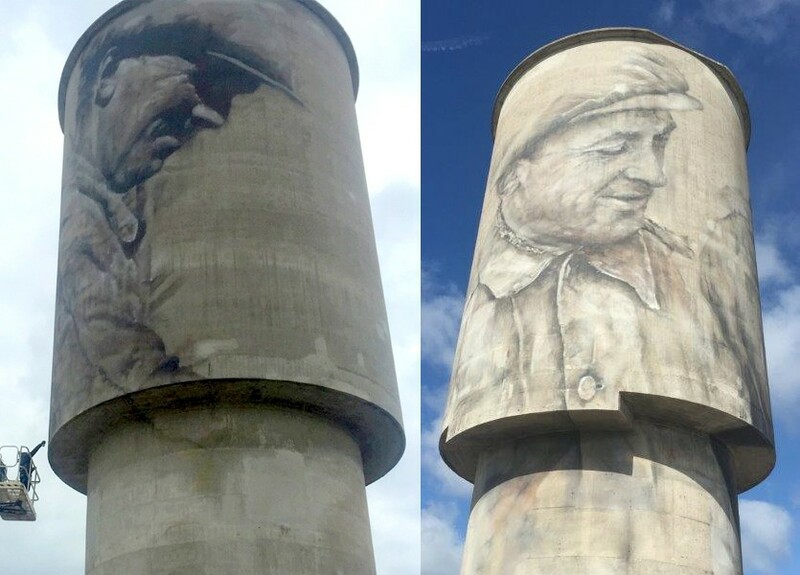 Just finished work by the Australian street artist Guido van Helten. 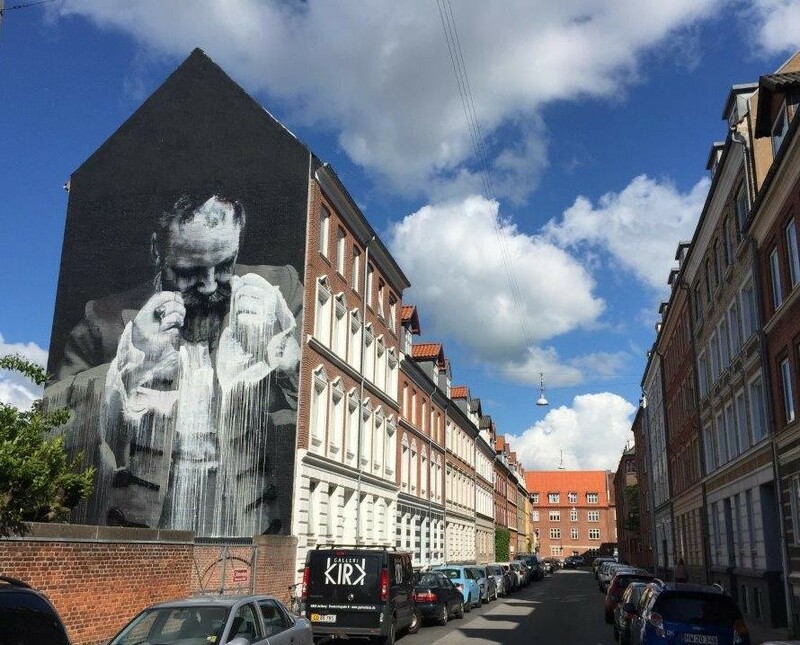 The work can be seen at "Eternitten" in Aalborg, as a part of the story of the worker at the old eternit factory that was once here, which for many years had great significance for many people in the city. Inside the silo there will then be established a workers museum, telling the story of the site. The project has been developed in cooperation with Søren Enggaard A/S, The city of Aalborg, the Mayor's Office, C. Flauenskjold A/S and not least Birgit Elgaard and Arne Schade. Accelerating at an enormous speed the two polish artists Robert Proch and Sepe has for the last few years expanded their work both at the international street art scene besides at exhibitions worldwide. In the spring of 2014 they both participated in the Out in The Open Mural project making the large scale mural; Mayday Mayday! After preparing for the wok and reading about how Denmark consists of many low-laying areas which easily could get flooded in case of increased global warming they created the mural 'Mayday Mayday!' with two figures looking out for help while the water raises and the symbolic windmills raises in the background. Located in the rejuvenated freight and railroad district, the mural reflects on the working-class history of the site. It depicts a worker that was part of building the railroad int the 1800. With her very caracteristic strokes Faith47 has managed to make another amazingly strong portrait as part of the history of the place. 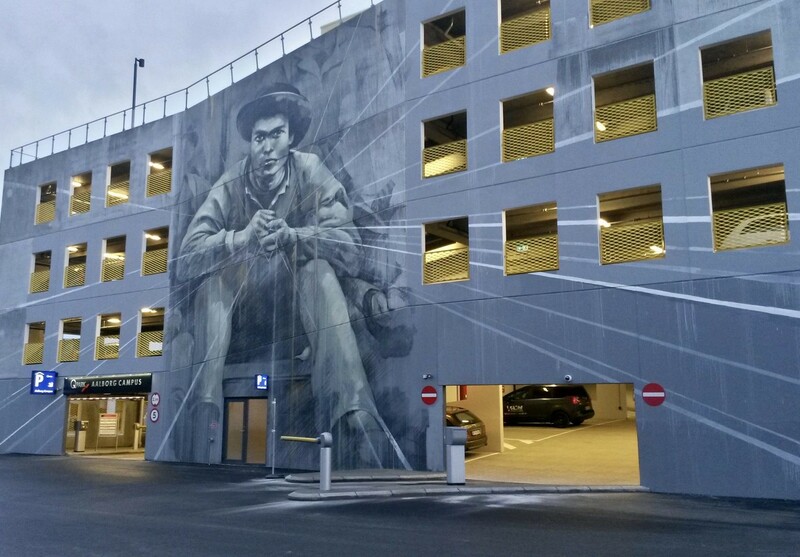 The Mural raises clearly along the Øster Allé bridge in downtown Aalborg. 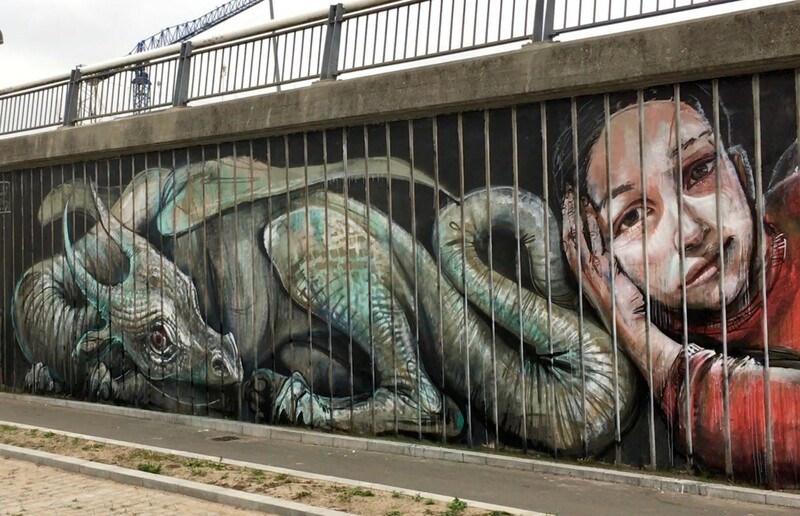 Despite her young age of 35 years FAITH47 has already received much recognition for her work, which now is represented worldwide and has made murals in China, Germany, USA, South Africa and many other places. FAITH47s success is largely due to the way she is faithful to the surroundings of the murals and the history here. She does not create random works, but works that are related to the specific place. Today Davis Walker I among some of the leading figures in the urban contemporary and street art movement. Working in portraiture, painting freehand, using only spray paint and without the aid of brushes David has developed a signature multi-layered style. Without aid of stencils or brushes London-based artist David Walker creates elaborately explosive portraits using directly applied spray paint. Even as the colors drip and mix on large outdoor walls it’s hard to imagine the level of control and detail the artist must possess to create the shadows, lines, and textures that create each piece. 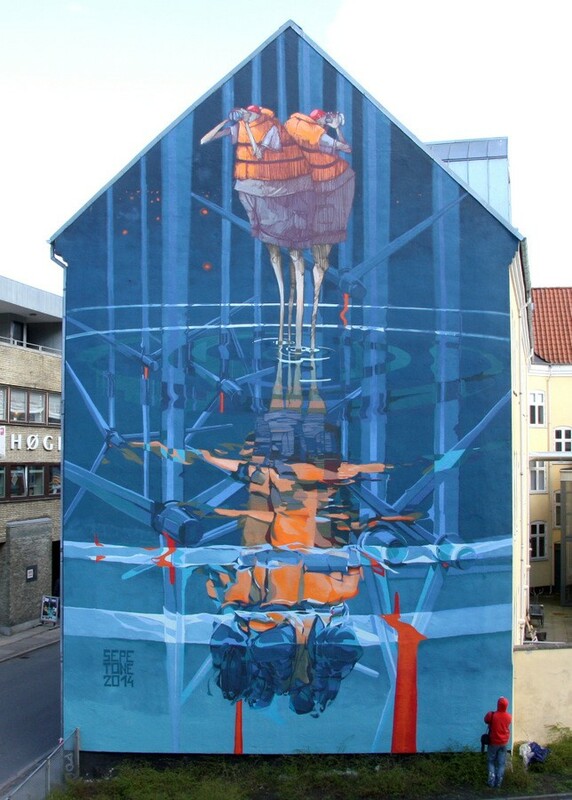 The Polish street artist Bezt has done some incredible murals around the world and we are very proud to present him in Aalborg, Denmark. 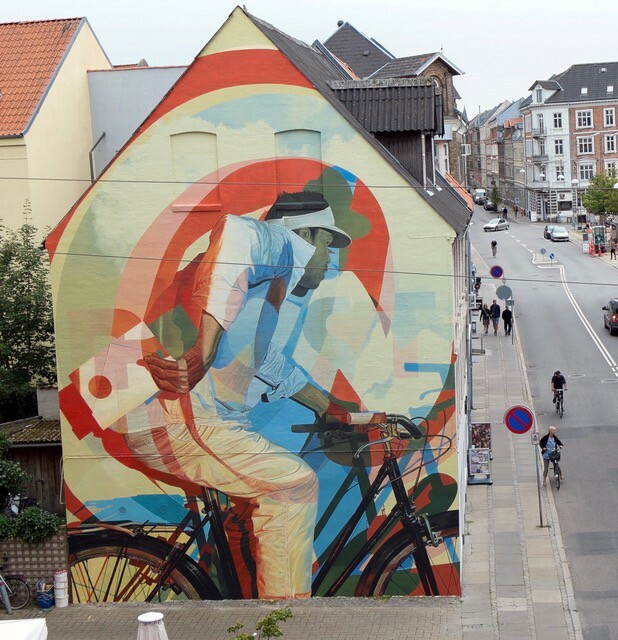 Together with Sainer, they are the Etam Cru and have put Polish street art on the map with their incredible large-scale pieces that can span buildings 10 floors high. Besides his street art and murals BEZT also do fantastic canvas work using oil and acrylic. How does the way we interact and communicate today affect our relationships? A hurried man riding into an @ with an old fashioned letter in his hand on his way to deliver it to a friend or loved one. Today, our modes of communication have drastically changed. If there is something important we would like to say, we send an email, text, or other digital message instead of an old fashioned letter - with all of the advantages and disadvantages therein. The artists wish to connect the past with the present and get us to think about what influence this has had on the way we live. At the same time, it is very important for them to note that there are postal workers on bicycles, since they noticed the many cyclists in Denmark and hope that the people will recognize themselves in the work and feel that it is theirs. Inspired by the surroundings of the beautiful nature in the area and the very friendly folks in Gedsted taking him in, Joram Roukes has managed capturing the people communing with nature, the ecosystem and all the breeding animals walking freely around in the area such as pigs, goats, deers and more. 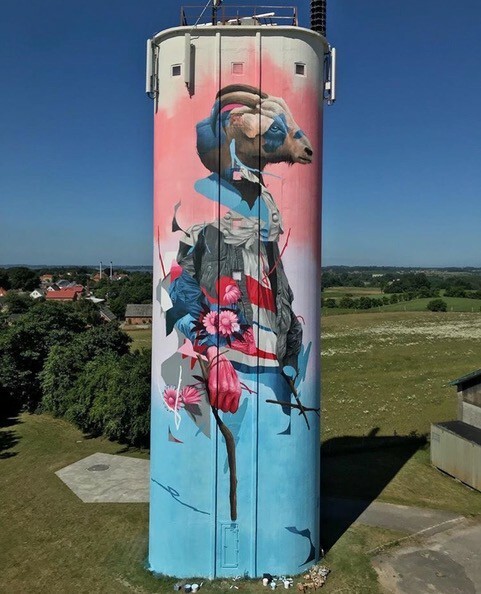 Intrigued by the way of life and the incredible helpfulness and hospitality of the inhabitants living in a small cabin in the woods right by the water, Joram Roukes ended up becoming a part of the society feeling inspired to paint a large mural on a 26 m high silo at the entrance of the town, besides working on new pieces at his cabin. The 900 inhabitants of Gedsted will never forget about him and took him in like one of their own while he was there. 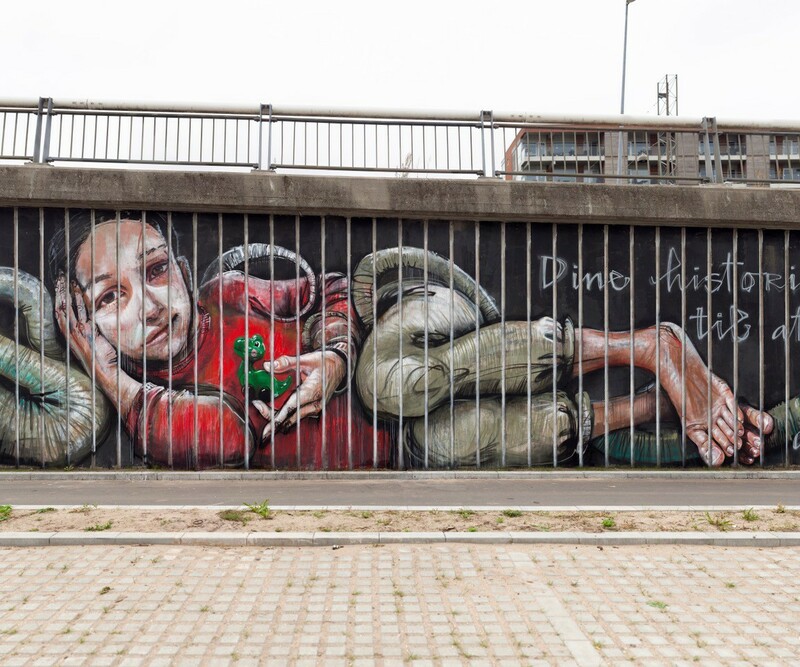 It is with great pleasure that we’re able to present the first mural in Denmark made the amazing duo HERAKUT. 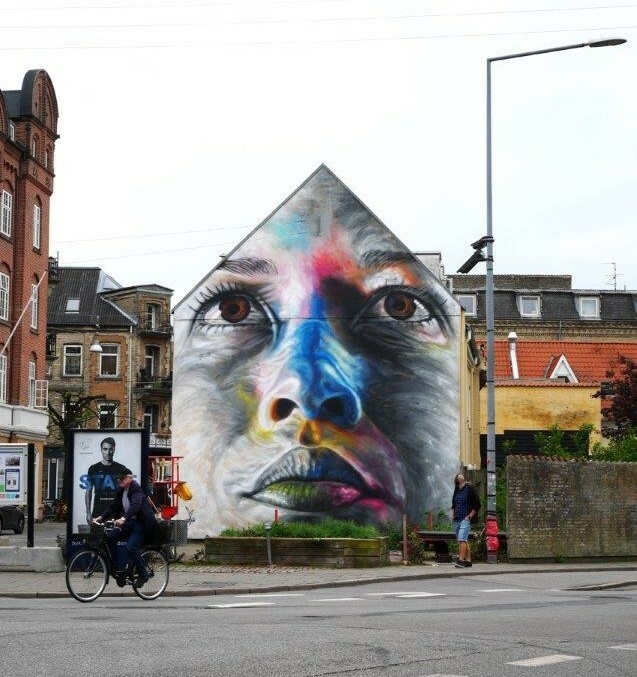 The German duo consisting of jasmine Siddiqui (Hera) and Falk Lehmann (Akut) started cooperation in 2004, and has now just completed a 50-meter long mural on the railyards downtown Aalborg "Your Stories make me forget those Prison Bars". A child’s imagination befriending dragons make her fly away to another world..
Characterised by their narrative style and their ability to lead the viewer into the imagination, a window opens into the mind of a child’s dreams in the middle of a parking lot downtown Aalborg. Expanding the horizon on the railyards at ”Godsbanen”, leading us into a new world, pausing for a minute in the hectic everyday lives. While HERA is a classically trained artist and works with a combination of medias, AKUT is self-taught and works solely with spray. In the intersection between the two talents, these two artists have created a distinct expression that, today, is known in the streets and alleyways world over. The imaginary world the subjects in their works often find themselves in the context of social factions and communal limitations embedded in verses of romance and love. The degree of contrast is endless, where a child-like dream world is often embodied with animalistic characteristics.